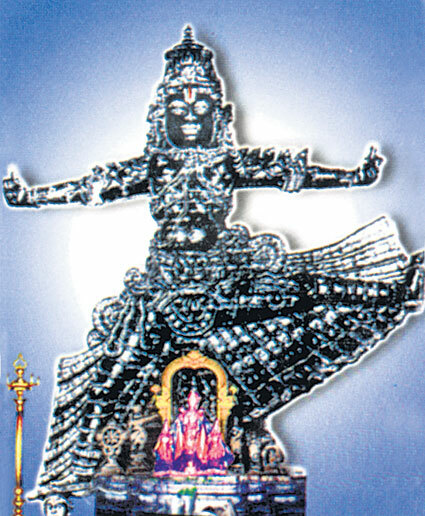 Ulagalanda perumal temple is dedicated to Lord Vishnu in the form of Vamana one of the Dasavatara’s. It is the 5th incarnation of Lord Vishnu. This Vamana temple is very near to Kamakshi Amman temple. It is one among the 108 Divya Desams . In Rig Veda there comes a reference of Vamana, who measured the three Loka’s in three steps. There are 3 Divya Desam’s inside this temple (Thiruneeragam,Thirukaragam and Thirukarvanam) apart from Vamana Murthy, as you go in Pradakshina marga. The deity of Vamana is about 35 feet height. The idol is in standing position facing west. His left leg is lifted high while his right leg rests on the head of Mahabali. Two fingers of left hand and one finger of right hand are shown as if he is saying two steps are completed and where is the place for third step. Mahabali is the grandson of Prahalada. Like his grandfather he is also a devotee of Lord Vishnu and very loyal and does charity. He was once fond of Indraloka and waged a war on Indra and capture Indraloka but he was defeated by indra. Sukracharya,guru of Rakshasas told him to do “Viswajith Yagam”. A GOLDEN CHARIOT CAME OUT OF THE HOMAKUNDAM with a lion symbol flag on it and a bow and Akshaya bana Thuneeram. After doing this Yagam he again went to Indra lokha and captured it. Adithi (wife of Kasyapa muni and mother of Lord Indra ) couldn’t bare his sorrow and she prays for Lord Vishnu. Lord Vishnu pleased by her prayer agreed to be born as their son as Vamana. Vamana was born in Sravana Masam, Dwadasa Thithi and he grew as a dwarf child of approximately 8years in no time. 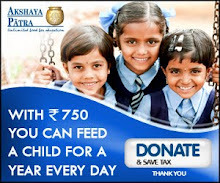 When Mahabali is performing a Yagna, Vamana went there with Umbrella given by Sky, Krishnajina given by Devatas, Dhandam given by Lord Chandra and Akshamala given by goddess SaraswathiDevi and Bhikshapatra given by Lord Kubera and asks Bali to give just three feet of land as Dhanam(charity). Sukracharya, identifies Vamana as Lord Vishnu and told Mahabali to refuse to do so. But Bali accepts to give the land. Immediately Vamana starts to grow big, this is called as Trivikramarupa. For the first step he covered the whole earth, for the second step he covered the entire sky, now Bali had no more Land to offer for the third step, so Bali offered his head in front of Lord Vishnu for the third step. Lord Vishnu kept his foot on the head of the Bali and pushed him to Pathalam(region below the earth). Pleased by bali’s he made him king of Pathalam and promised to make him Indra at the time of Savarni Manuvu. Until then he is made as Adhipathi of Pathalam(underground)made by Viswakarma. AS PER THE WISH OF MAHA BALI LORDVISHNU ALLOWED HIM TO COME ON TO THE EARTH ONCE IN A YEAR. THAT DAY IS CELEBRATED AS ONAM IN KERALA. People of Kerala believe that Bali is the king of Kerala and the whole Vamana Vruthantham happened in Kerala. We can also find a Vamana temple near Kochi in Kerala. 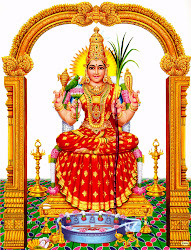 It is believed that those who listen this Vamana Puranam will have the blessings of Lakshmi Devi and any mistakes done during Pitrukaryam will be removed . Vamana Murthy here is made of Lime. So Abishekam is not performed. Sometimes some specially made paste is applied to the Murthy, so that it is not damaged and retains its glow. Adishesha prayed Lord Vishnu to be there in Trivikrama rupa, so it is called as ULAGALANDA PERUMAL TEMPLE. In Tamil it is called as”URAGAM”. Uragam means Snake. There is a special place for Adishesha and pooja’s are also done. You can find this on your left while going near to the main deity. For the blessing of rahu, for Sarpadosha Nivarana and for marriage devotees perform poojas to Adishesha in this temple. THIRUMANJANAM, CHANDANA ALANKARAM, AND PONGALI NEVADANA ARE DONE IN THIS TEMPLE. For Thirumanjanam you need a prior booking (APPROX before 3 TO 4 months). For Pongali Nivedana you need to tell them one day before. It costs around 250Rs. Devasthanam will only arrange Pongali and it is kept at Adishesha and given to you as prasadam. Call temple for further details.